Houzz began in June of 2008 as a side project for founders Adi and Alon. They had just completed a home remodel and after struggling with organizing recommendations from friends and inspiration from magazines, they built Houzz. Now, Houzz is a community that consists of over 40 million homeowners, home designers, and home improvement professionals. Creative Design Construction & Remodeling is proud to win the Best of Houzz 2017 for Design and Service for 5 consecutive years. In addition, our photos have been shared over 100,000 times! We know what the benefits of using Houzz are, so we decided to share them today. Inspiration. The first step in any construction or remodeling process is to get inspiration! You need to determine what you like and don’t like so you can easily communicate it with design and construction professionals. Houzz provides the opportunity to get inspiration from professionals and save your ideas in your own personal idea book that is easy to share. Tips, tricks, and advice. Houzz has its very own section dedicated to advice and stories. 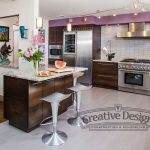 You can learn from professionals on best design trends for 2017 and get answers to home renovation questions you may have. Shopping guide. How many times have you seen a picture online or in a magazine and wanted to know where you can buy it? With Houzz, there are buying guides available for the house. You can find unique décor to reflect your personal style and have information as to where to buy it. Find professionals. Houzz is a great space to find construction professionals to execute your vision. Look through portfolios, read reviews, and find contact information. Creative Design Construction & Remodeling has been helping make home dreams a reality since 1988. Our attention to detail, excellent customer service, and high quality of work has earned us numerous awards. View our previous projects to get inspiration for your home. Contact us today to learn how we can help remodel your home.